Interstate 555 overlays U.S. 63 along a freeway stretching northwest from I-55 at Turrell to Arkansas 91 on the west side of Jonesboro. A mostly rural route, I-555 serves the small cities of Gilmore, Tyronza, Marked Tree and Bay as it joins the Memphis area with Trumann and Jonesboro. U.S. 63 was established as High Priority Corridor 39 in 1998.1 Until 1999, U.S. 63 ended at Turrell and Interstate 55. A southward extension lengthened the route to I-40 at West Memphis, Hazen and I-20 at Ruston, Louisiana. 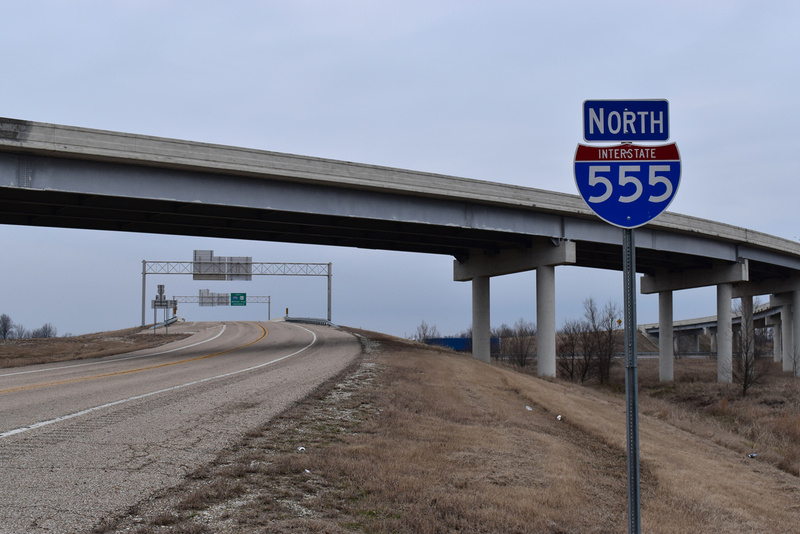 AHTD submitted an application to the AASHTO for the establishment of Interstate 555 along U.S. 63 from I-55 north of Marion to Arkansas 91 in Jonesboro on April 16, 1999. The Route Numbering Subcommittee however disapproved the designation because significant portions of the expressway did not meet Interstate standards and would not for some time. AHTD applied to AASHTO for I-555 again and was subsequently granted Future Interstate status for the route December 9, 2000. 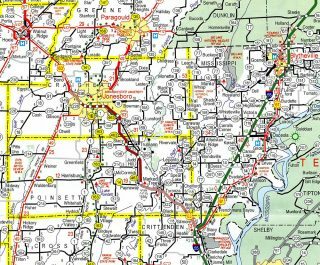 Signed for nearly 15 years as Future I-555, the Arkansas State Highway Commission voted to designate 44 miles of U.S. 63 as Interstate 555 on December 2, 2015. Language in the FAST bill signed by President Obama on December 4, 2015, included the exemption for building a two-lane frontage road across the St. Francis River floodway for farm vehicles. This exemption saved ArDOT $33 million in costs estimated for building the road required to accommodate farm vehicles. Without the exemption, as farm vehicles are prohibited otherwise from using an Interstate highway, farmers would otherwise be forced to make a 90-mile detour to circumvent U.S. 63 / I-555.3 Signs referencing the farm equipment usage went up on I-555 on January 28, 2016. 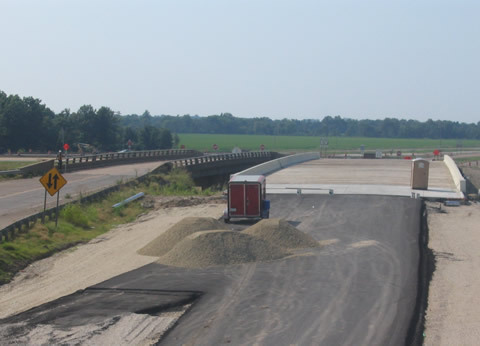 $250 million in upgrades took place along the U.S. 63 corridor over a 40 year period leading to the redesignation of I-555 from a Future route.3 I-555 remains unposted west from U.S. 49 to Highway 91. * – Email correspondence with Danny Staessle, AHTD Public Information Officer on June 2, 2016. 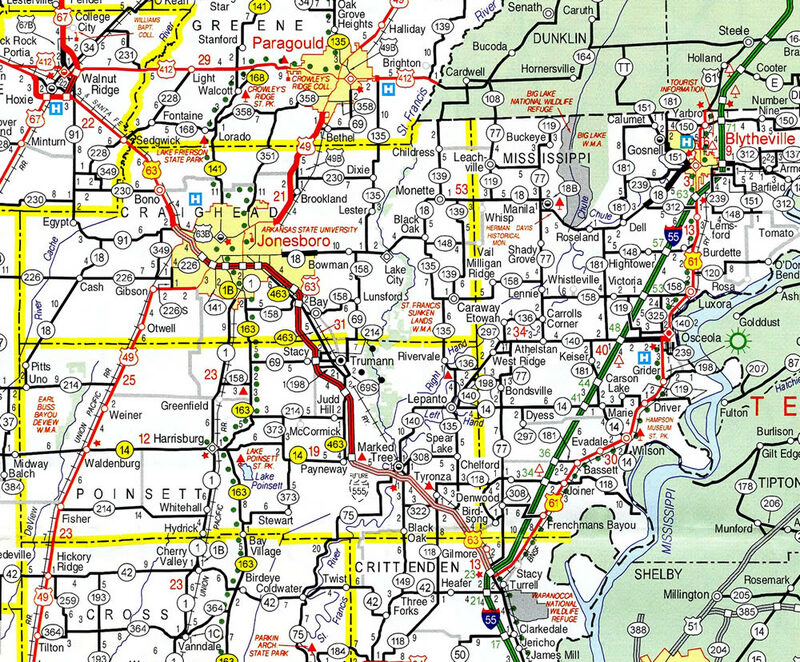 Future Interstate 555 on the 2003 Arkansas Official Highway Map. Future Interstate 555 corridor sign along U.S. 63 between I-55 and Jonesboro. Photo taken by Chris Lawrence (2001). Construction for the eventual overpass taking Interstate 555 across I-55 at Turrell. Photo taken by Robert Lee (07/08/06). 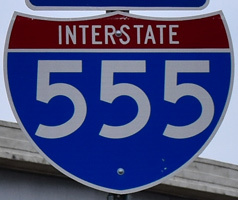 Interstate 555 signs discontinue along the U.S. 63 freeway north at the split with U.S. 49 south at Exit 45. Photo taken 01/14/19. U.S. 63 passes by Joe Mack Campbell Park on the one mile approach to Exit 49 with Arkansas 91 (Dan Avenue). Photo taken 01/14/19. U.S. 63 downgrades to a five-lane surface arterial beyond Arkansas 91 (Dan Avenue). Arkansas 91 east leads back toward Downtown Jonesboro while the state highway west takes a stair stepped route to rural Winesburg and Egypt. U.S. 63 connects Jonesboro with Hoxie, Walnut Ridge and U.S. 67 (Future I-57). Photo taken 01/14/19. U.S. 63 south transitions to the Joe N. Martin Expressway through the west side of Jonesboro at the parclo interchange (Exit 49) with Arkansas 91 (Dan Avenue). I-555 was approved to this exchange in 2016 but remains unmarked. Photo taken 05/03/12. U.S. 49 combines with I-555 & U.S. 63 south from Southwest Drive and Highway 18. Signage for Interstate 555 along U.S. 63 starts at the parclo interchange at Exit 45. Photo taken 01/14/19. Although not marked, U.S. 61 & Arkansas 77 south combine with Interstate 555 & U.S. 63 from the rural city of Gilmore to I-55 at Turrell. Photo taken 01/14/19. Frontage roads accompany I-555 south across Little Cypress Bayou to from Gilmore to the west side of Interstate 55 by Turrell. U.S. 61 and 63 continue 16 miles south along I-55 to Interstate 40 from forthcoming Exit 1A. Photo taken 01/14/19. A single lane ramp (Exit 1A) departs I-555 south for I-55, U.S. 61 & 63 south to West Memphis and Memphis, Tennessee. Photo taken 01/14/19. Arkansas 77 extends from the south end of Interstate 555 at Lake David into the city of Turrell. Exit 1B loops onto I-55 north to St. Louis, Missouri. Photo taken 01/14/19. Paralleling the Mississippi River, Interstate 55 angles northeast along a rural corridor to Blytheville. U.S. 61 follows to the east from Turrell north to Osceola while Arkansas 77 runs south along I-55 to U.S. 70 in West Memphis. Photo taken 01/14/19. Leading north from Arkansas 42, Interstate 55 and U.S. 61-63 separate at Exit 23. Interstate 555 takes U.S. 63 northwest 44 miles to Jonesboro, where it emerges to Bono and Hoxie. Photo taken 01/14/19. Exit 23 departs I-55 north for I-555, U.S. 63 and Arkansas 77 north to Gillmore, U.S. 61 north to Wilson and Arkansas 77 south to Turrell. Photo taken 01/14/19. The flyover connecting I-55 & U.S. 63 north with Interstate 555 to Marked Tree was completed in 2006. Highway 77 overlaps with I-555 north from Turrell to Gilmore, where it doubles back south along the east side frontage road. Photo taken 01/14/19. Originally a six-ramp parclo interchange joined Interstate 55 & U.S. 61-63 north with Arkansas 77 at Turrell. The loop ramp (old Exit 23B) for Marked Tree was replaced with the flyover for Interstate 555. Photo taken by Jeff Morrison (12/29/01). A ten mile exit less stretch along Interstate 55 south culminates in northern Crittenden County where Interstate 555, U.S. 61, U.S. 63 and Arkansas 77 converge. Arkansas 77 and U.S. 61 parallel I-55 leading into the exchange at Turrell. I-55 subsumes U.S. 61 & 63 southward to West Memphis while I-555 overlays U.S. 63 northwest to Jonesboro. Photo taken 04/14/13. A BNSF Railroad line passes over Interstate 55 south just ahead of directional cloverleaf interchange (Exit 23B) with I-555, U.S. 61, U.S. 63 and Highway 77. Photo taken 04/14/13. Interstate 555 & U.S. 63 lead motorists northwest 13 miles to Marked Tree and 28 miles to Trumann. Photo taken 04/14/13. Arkansas 77 north at U.S. 61, I-55 and Interstate 555 at Turrell. U.S. 61 follows the east side frontage road of I-55 northeast toward Wilson. Photo taken 01/14/19. The entrance ramp for Interstate 55 north to Blytheville and St. Louis, Missouri follows from U.S. 61 south & Highway 77 north. Interstate 555 begins just ahead. Photo taken 01/14/19. The left turn from U.S. 61 north & Highway 77 south was eliminated during construction to upgrade the exchange at I-55/555. The two highways continue north with I-555 to Gilmore, where U.S. 61 doubles back southward to join Interstate 55. Photo taken 01/14/19. 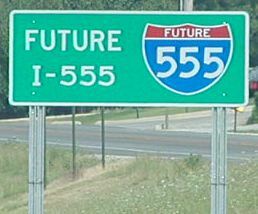 “Re: AR: Future I-555” online posting by Grzrd, AARoads Forum, July 26, 2014. "Highway Commission OKs designating portion of U.S. 63 as I-555." Arkansas News, December 2, 2015. “Re: AR: Future I-555 ” online posting by AHTD, AARoads Forum, December 4, 2015. "I-555 to be dedicated Friday in Jonesboro." KASU, March 9, 2016. Special Committee on U.S. Route Numbering meeting scheduled for May 24, 2016. AASHTO 2016 Spring Meeting in Des Moines, Iowa.